It’s been nearly a year since the Mill One V2 was featured on Make Magazine, which was a pretty big deal for us. 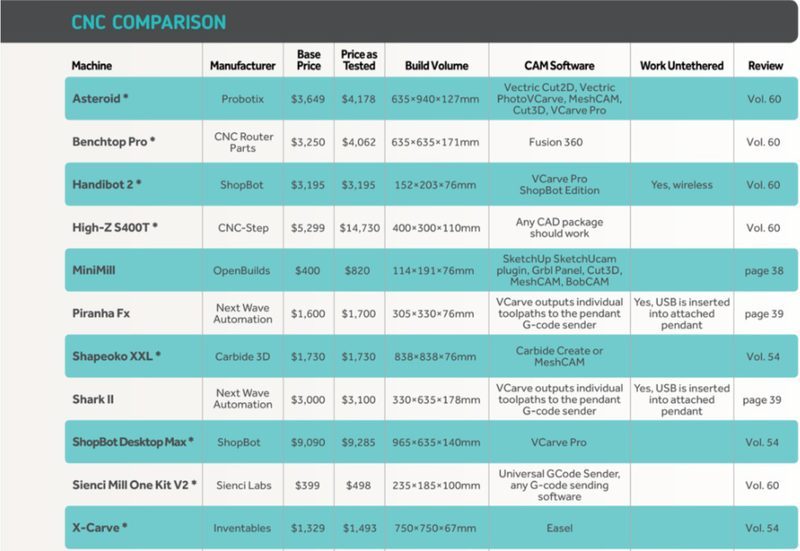 This year, Make Magazine reviewed another three desktop CNC routers, adding to their list of tested CNC machines. * We’re basing that statement off of the tested price. Although the MiniMill might have a basically have the same base price as the Mill One V2, the tested price is much higher. That’s because the base model doesn’t come with any electronics (no motors, power supply, and control board), whereas since the Mill One includes that in the base price, the only extra item needed from the base machine is a router. The V3 is a little more expensive than the V2 was. That’s because of all the extra parts and components we’ve changed and added to make the V3 an even better and stronger machine. Even still, nothing can touch the Mill One as a perfect place to start CNC milling as a hobby, and we’re proud of that.